The Carrion Crow (Corvus corone) can be distinguished from the Common Raven by its size (48–52 cm in length) and from the Hooded Crow by its black plumage, but there is frequent confusion between it and the Rook. The beak of the Crow is stouter and in consequence looks shorter, and whereas in the adult Rook the nostrils are bare, those of the Crow are covered at all ages with bristle-like feathers. This species breeds in western and central Europe, with an allied form or race C. c. orientalis (50-56 cm in length) occurring in eastern Asia. 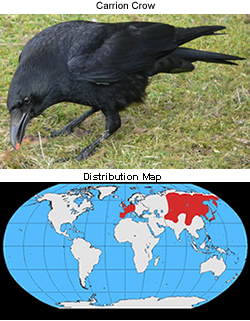 The separation of these two populations is now believed to have taken place during the last ice age, with the closely allied Hooded Crow (now given species status) filling the gap between. Fertile hybrids occur along the boundary between these two forms indicating their close genetic relationship. The plumage of Carrion Crow is black with a green or purple sheen, but the gloss is much greener than that of the Rook. The bill, legs and feet are also black. Though an eater of dead animals of all kinds, the Carrion Crow will kill and eat any small animal it can catch, and takes eggs. Crows are by nature scavengers, which is why they tend to frequent sites inhabited by humans in order to feed on their household waste. The bulky stick nest normally placed in a tall tree, but cliff ledges, old buildings and pylons may be used. Nests are occasionally placed on or near the ground. The nest resembles that of the Common Raven, but is less bulky. The four to six brown-speckled blue or eggs are incubated for 17-19 days by the female alone, who is fed by the male. The young fledge after 32-36 days. It is not uncommon for an offspring from the previous years to stay around and help rear the new hatchlings. It will not, itself, take a mate but will instead search for food and assist the parents with feeding the young.